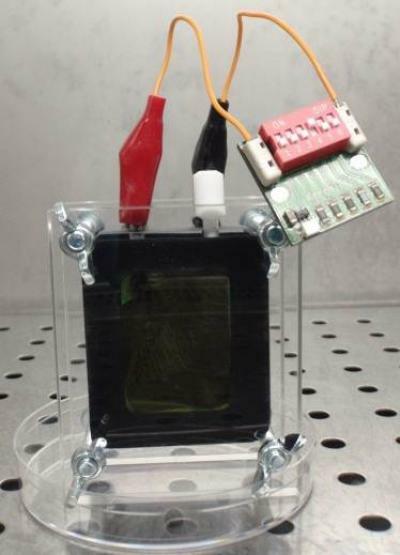 A lab-scale microbial fuel cell, used to study the generation of electricity from waste products. Distillers Dried Grain with Solubles (DDGS) is a waste product from bioethanol production that is commonly used as a low-cost animal feed. Researchers from the University of Surrey incorporated DDGS together with bacteria-inoculated sludge from a wastewater treatment plant in their microbial fuel cell. The design of the fuel cell meant that the bacteria, which used the DDGS for growth, were physically separated from their oxygen supply. This meant that the bacteria were forced into sending electrons around a circuit leading to a supply of oxygen. By tapping into this electron flow, electricity could be generated from the waste. Microbial fuel cells offer the ability to convert a wide range of complex organic waste products into electrical energy, making it an attractive target technology for renewable energy. Finding cost-efficient starting products is necessary to help commercialize the process, explained Lisa Buddrus who is carrying out the research. “DDGS is potentially one of the most abundant waste products in the UK. As the biofuel industry expands the supply of DDGS will become more abundant,” she said. “The next step for us is to identify the electrogenic bacterial species that grow on DDGS. Furthermore, by looking at genetics across this microbial community, we will be able to better understand the metabolic processes and essential genes involved in electron liberation and transfer.” she said. As well as being low-cost, microbial fuel cells that use DDGS are very environmentally friendly. The waste that is left following electricity extraction is of greater value, as it is less reactive with oxygen, making it less polluting. “We’ve found something really useful from a waste product without affecting its value as animal feed and at the same time improving its environmental status. This is something we place great importance on and within our group we have a team solely dedicated to reducing polluting potential,” said Professor Mike Bushell who is leading the group. A lot of microbial fuel cell research focuses on developing environmental sensors in remote locations. “Self-powered sensors in remote places such as deserts or oceans can be used to provide important data for monitoring weather or pollution. Other applications in focus for microbial fuel cells include treating waste water to produce green electricity and clean up the water at the same time,” explained Professor Bushell.